Having visited the Winebar the night before (and with nary the suggestion of a hangover to boot), it seemed odd that I would be returning to the same spot for an entirely different experience. 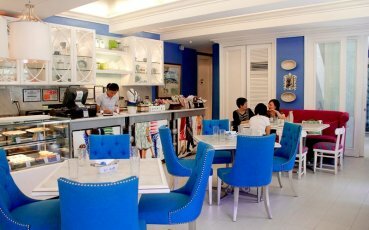 Yet here I was once again, in the searing morning summer sun at El Pueblo in Ortigas Center–for brunch this time, at Café 1771. Comparing the Winebar to Café 1771 was like night and day, two sides of the same coin yet each distinct from the other. If the Winebar seemed the perfect place to bring a date for an intimate evening of wine and charm, then Café 1771 would be ideal for bringing family and friends. There was something reminiscent of Amélie Poulain and her world about Café 1771. Perhaps it was the cherry red seats with the brocade china blue embossed leaf and flower designs. Or maybe it was the way the mid-morning sun shone brightly through the French windows to play fancifully against those selfsame leaf and flower designs as they crept gaily towards the ceiling. Or maybe it was the powder-blue walls framed by milk-white arches, frames, and doors. Everything seemed to scream joie de vivre, and I couldn’t help but feeling bright and chipper, as if I swallowed a whole bag of upper-laced jellybeans. Small wonder that this part of Café 1771 is called The Whimsy. However, I was ushered into another part of the Café called The Lounge, which was a zebra of a different stripe. I found myself in what appeared to be an aqua-and-cream dining area made to look like an American Colonial-style library, filled wall-to-wall with a smorgasbord of subjects–Philippine law, medicine, Grolier encyclopedias, Greek tragedies, even French children’s books. The books were backlit, giving the impression of museum-showcased artifacts–only these looked like management wouldn’t mind too much if you perused one while waiting for your meal. Off to one side was a cheerfully painted rendition of a world map, one conceivably by Gerardus Mercator, were he into Day-Glo color schemes. The whole upper-laced jellybean buzz went sober but the feeling of well-being remained, like being at a favorite grandfather’s house, if that grandfather were ridiculously wealthy, taught Philippine Studies in Harvard, and lived in Maryland. Leaning back on a slim crystal plastic chair (wow, I’ve never seen one of those), I settled in for what would be a memorable meal. For starters, I had Fried Squash Flowers, deep-fried, stuffed with anchovies and kesong puti (white carabao cheese) and topped with arugula and a marinara-like sauce. The squash flowers were breaded with what felt like tempura batter and were intriguingly salty-spicy. Salmon Niçoise Salad followed, served in light–almost imperceptible–vinaigrette with mixed greens, hard-boiled egg, French bans, and tomatoes. The whole thing is a wild, wonderful mess of greens, whole robust slices of anchovy (none of the dinky sprinkled stuff on pizza), and salmon slices with marble potatoes. 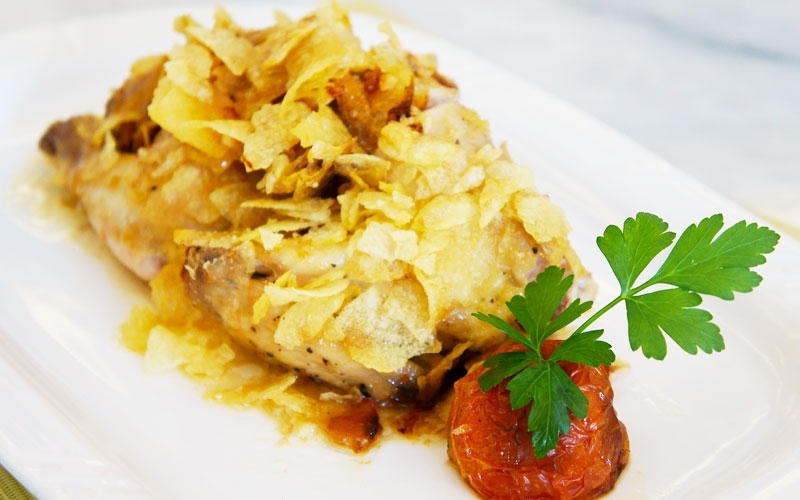 Slow-cooked dishes are a specialty at Café 1771 and I didn’t hesitate to get the Slow-Baked Organic Chicken, a one-two punch for being organic as well as slow-cooked. The nicely plump bird was barely hidden under its potato crust raiment, covered as it was in cracked potato chips. It was very similar to a country-style cornflake-crusted chicken but with a restrained sweetness to it that tickled the palate. The chips remain crunchy even after all that baking which complemented the juiciness of the chicken. As Café 1771 was gearing up for its launch of their new steak menu in April, I was eager to sample some of their beef fare. I got Steak and Frites with creamy spinach, a one-inch thick locally-sourced Angus striploin steak grilled to my specifications (medium rare for me, thank you). The steak was served with a mushroom reduction sauce and chunky French fries and had a hint of seasoning that seemed ingrained in the meat as if firmly but patiently rubbed in. The meat was not too tender so as not to lose its identity as steak. 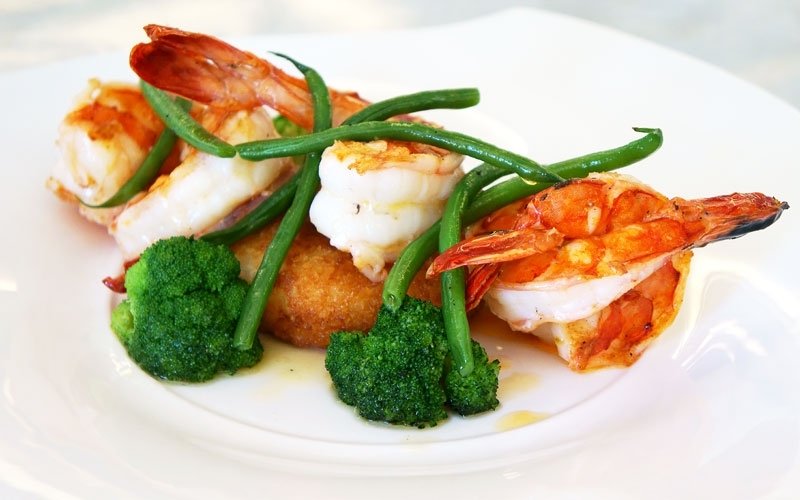 Our waiter also brought in Lime Butter Prawns, grilled headless prawns with lime-butter sauce and served with grilled broccoli and a crispy-on-the-outside-soft-on-the-inside risotto cake (which looked like a hamburger patty masquerading as a hash brown). The risotto cake was an interesting diversion from most risotto dishes, retaining its creamy texture in spite of its lightly fried exterior. To complete the food groups of meat, poultry, and fish, we saw the arrival of the Laquered Salmon, a grilled salmon steak with a soy sauce honey reduction (Japanese ponzu sauce) and smashed potatoes, lightly dusted with parmesan cheese and topped with luscious asparagus spears. The ponzusauce is a more understated version of teriyaki sauce, with a less overpowering aroma and a more umami taste. The smashed potatoes have their skins kept on and live up to their names as smashed spuds; they aren’t mashed to custard but look like they were hammered and happily roasted for a crunchy coat with a velvety interior. After a feast like that, I was glad to walk off the rest of the afternoon in the various nearby malls. But rest assured, I’ll be back there again with friends someday. 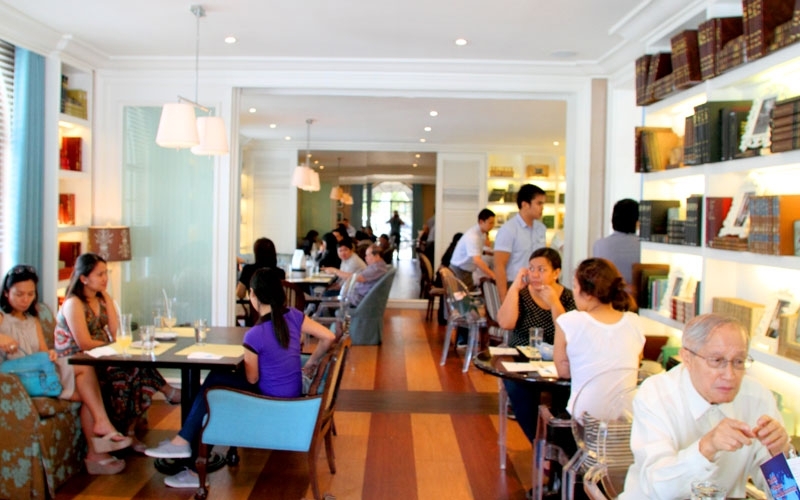 Although that selfsame cuisine is more French/Swiss at Café 1771, Cruz is quick to defend its local roots. “Much of the innovation in our dishes comes from Chef Vicky Rose Pacheco and the Chateau Group’s ‘No Borders Cuisine’ concept. And if you know Chef Vicky Rose, you know she will try to build every dish from scratch to make sure it’s as fresh and as unique as it comes.” To make certain that the ingredients and produce are up to par, Chef Vicky Rose often handpicks the suppliers herself and deals with them on a regular basis. © CAFE 1771 2019. All rights reserved.